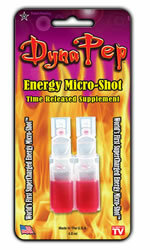 DynaPep Energy Micro-Shot delivers a time-released suspension of caffeine that provides hours of long-lasting energy. The newest version of DynaPep Energy has 100mg of caffeine which is 20mg higher than their original product. DynaPep is available in 3 flavors; Berry, Mint, and Cinnamon. So you've come here with some free time, seeking a little snack for your internet appetite. Given that today's review covers the highly portable Dynapep adrenaline vials, you've come to the right place to wield your free time. Read on to discover one of the market's most significant new additions! Dynapep comes in two flavors: Fresh Mint and Original. Both of the tastes do their best to mask the uniquely disturbing taste of the liquid (bitter plastic? ), but it ultimately proves to be too great a task. Alongside some confusing but meaningful words like "adrenaline- inducing phytochemicals", we have 80mg of caffeine and 6,000% of your B12 daily value in the ingredients list. Not sure what's all in this stuff, but as you'll see below, it does seem to do something. For one - maybe two - joy-filled hours, Dynapep raises you to the top of the world, where you can look down at all the little peons and laugh maniacally at their lack of the supreme energy you're experiencing. For less than two hours. This is one of the most punctual energy products I have ever consumed. The liquid seems to go to work as it hits your tongue, and drops you off about as fast as it came on. It's a remarkable and disheartening experience, and I still love it dearly. A note on the feel of the energy. The energy Dynapep gives you is truly unique, I struggle to find comparisons. Basically, Dynapep offers you tried and true "do-stuff" energy, and I'd highly recommend you reserve its use for physical endeavors you're undertaking to get the best utility from it. Like sports. If you are athletically involved, you'd benefit from always keeping a Dynapep on hand to give you a powerful yet refined energy boost before or during your game/match/whatever. Consider Dynapep a legal supplement advantage over your opponents, to put it directly. Yes, you need to try this product for yourself. You have my personal word on that, it's highly effective. Just keep your expectations low when it comes to taste and effect duration. If the initial boost could last for a minimum of 3 hours, Dynapep would be one of the best energy products money can buy. But it doesn't, leaving it as a respectable novelty in the energy market. Who knows where this product is going to end up, but consider our support granted. DynaPep contains 714.29 mgs of caffeine per fluid ounce (2415.29mg/100 ml).